Learn how to add new individuals to your team account and give them the correct permission levels. 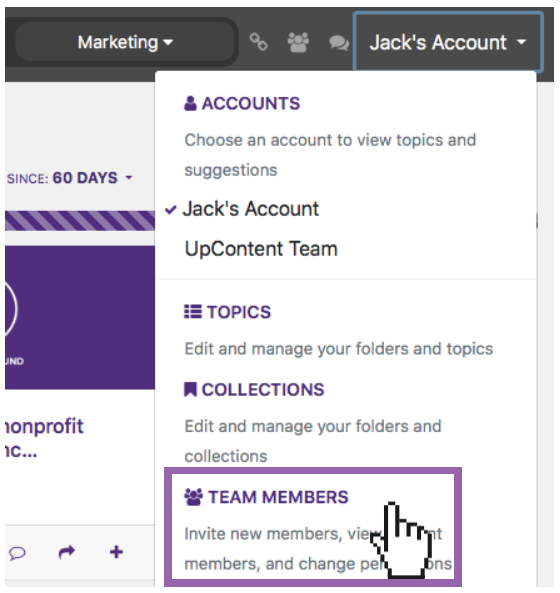 To add new team members to your account, begin by either clicking on the Members icon at the top of the screen. Or by clicking into the team members screen from the account drop-down at the top right of the screen. Then, select "Team Members" from the drop-down menu. This will take you to the team member management screen. To add a new member, click on "Invite Member"
Enter the individual's email, select their permission level , and click "send invitation". You also have the opportunity to go-ahead and assign this member to any folders you wish at this point, which you will eventually need to do to begin collaborating. NOTE: Account permissions and folder permissions are slightly different. You will then see the invitation and it's status in your team member settings. The invite will remain active for one week before expiring. You can re-send, or rescind the invitation at any time by using the two buttons to the right of the invite.